I called several places, but Empire Today was the only one that talked to me on a Saturday afternoon and scheduled a person to come out Monday. Everybody else waited until Monday or Tuesday to even call me back. I had hardwood installed in my master bedroom. It was in our price range and they could do it in the timeframe that we needed. The color is great and they're easy upkeep. They're better than my original hardwood in the rest of my house and they were factory finished unlike the others. The people we worked with were very professional and the guys that came in were very nice and worked on what they needed to do and got it done. It was a good experience. A lot of times when you're putting in hardwood, you have insulation under it, but our garage doesn’t have any. Naturally if you're putting in hardwood and you're putting in nails, there were splinters everywhere, and I showed that to the installer. But he said, “No problem. We can still sweep this. 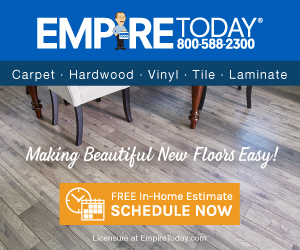 Product or Service Mentioned: Empire Today Flooring Installation. Review #1060349 is a subjective opinion of testimonial.